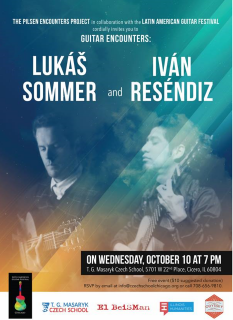 On October 10, 2018 at 7 pm, Czech guitarist and composer Lukáš Sommer and Mexican guitarist Iván Reséndiz, founder of the Latin American Guitar Festival in Chicago, will perform at the T.G. Masaryk School (5701 West 22nd Place, Cicero, IL 60804). The concert is organized in the framework of the Pilsen Encounters project and in collaboration with the Latin American Guitar Festival. Space is limited - please reserve your seat at info@czechschoolchicago.org. Lukáš Sommer will also perform at the Latin American Guitar Festival in the Citlalin Gallery and Theater, 2005 South Blue Island, Chicago, on Saturday October 6, 2018, at 8 pm, and in Café Prague, 6710 West Belmont Avenue, Chicago, on Sunday October 7, 2018, at 7 pm.